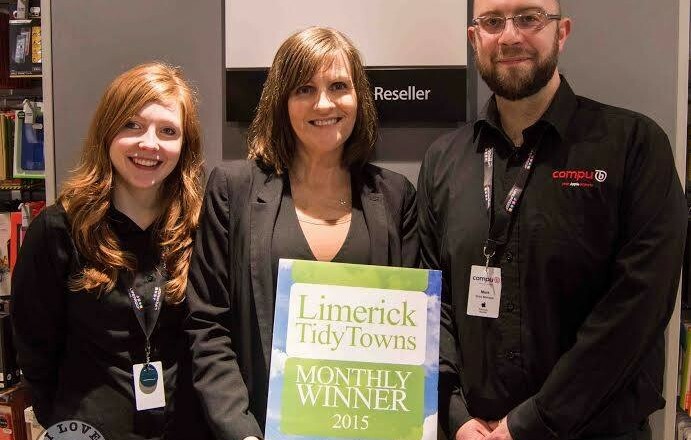 Congratulations to the Compu b store at 121 O’Connell Street which has won the Limerick Tidy Towns Monthly Award for May for its enormously positive impact on the retail heart of Limerick city centre. Pictured being presented with the award at the premises by Maura is Store Manager Mark Power and Assistant Manager Aisling Orr. Anyone who knows Limerick city centre will be aware of how welcome Compu b were when they took over the former Kiely’s Electrical building on O’Connell Street, which had lain empty for many years and was an unsightly scar in the streetscape of a very prominent location in the business and retail centre of Limerick. Since Compu b moved there in September 2014, the site has been transformed into a modern state of the art retail unit, which is hugely beneficial not just to the aesthetic appearance of O’Connell Street which is very important from our perspective, but also to its impact on enticing increased footfall to the city centre. 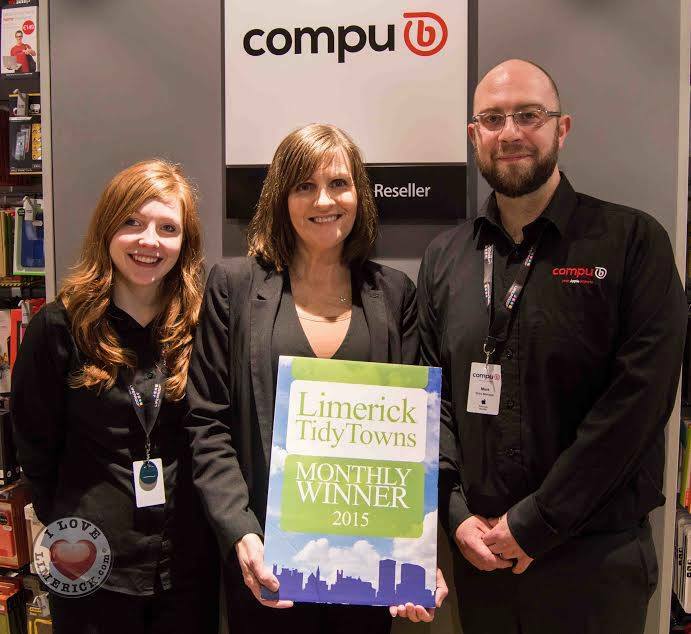 Compu b is Limerick’s only Premium Apple Reseller and all staff are APP (Apple Product Professional) Certified. Items sold include MacBook, Macbook Pro & MacBook Air, desktops iMac, Mac Mini, Apple TV, iPods, docking stations, external hard-drives and the widest range of accessories for laptops, desktops, cars, iPhone and iPod. Their friendly expert staff can help you with Apple products, accessories and more and offer support and guidance for both business and personal customers alike. Compu b also offer regular training courses in the in-store training room, on site product servicing and have dedicated Business to Business and Education departments. For further details visit their website on www.compub.com, call 061 440022 or simply drop in. Compu b is the fifth recipient of our monthly awards for 2015, with The Stormy Teacup having won in January, Thomas Street Framing Centre in February, Bobby Byrne’s in March and Parnell Plaza in April. An overall winner will also be chosen at the end of the year and if members of the public wish to suggest future monthly winners which they feel merit the award, please do let us know. Many thanks to Billy Butler of www.ilovelimerick for the photos!